a one-day early morning departure thing? yes. go big....! try and be in campbell river by 0800 to 0830, prob leave concrete at about 0630 or a little later. forecast beyond sat not looking so great. sat image this moment is clear for 500 miles.... i'll fuel the plane tomorrow. And that is how a trip of a lifetime comes into being. Eight email minutes and a few months of behind-the-scenes planning, weather-watching, and missed opportunities due to schedule conflicts. 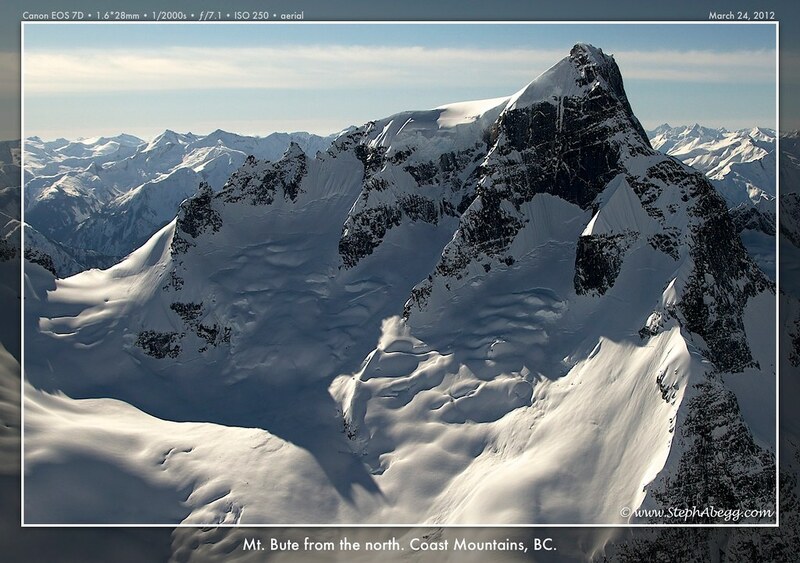 Within a 10-hour span on the third day of spring, John Scurlock and I flew a circuit of 833 miles to the incredibly rugged terrain of the British Columbia Coast Mountains and back. Our primary intent, which we executed to the fullest, was photographing Mt. Waddington. With clear skies and manageable winds, we circled around Waddington several times, and also around the nearby Combatant, Tiedemann, Asperity, Serras, and Mt. 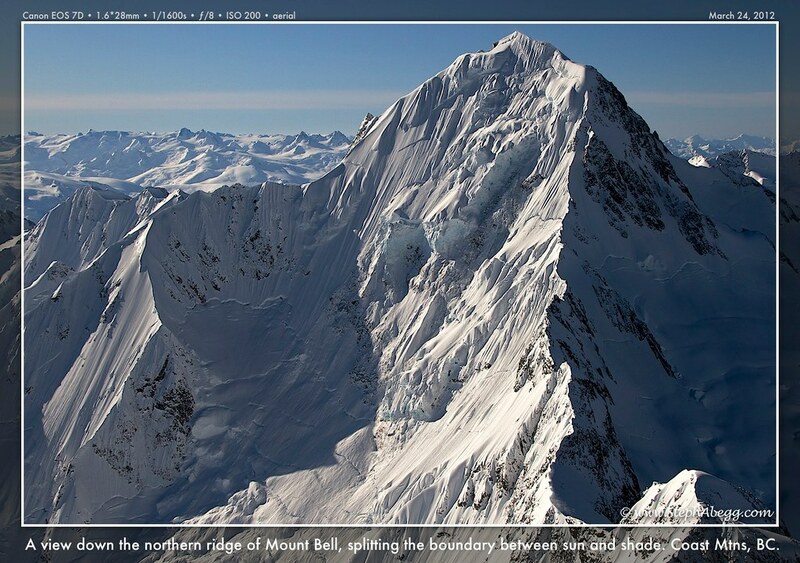 Bell, all of which are amazing summits in themselves. 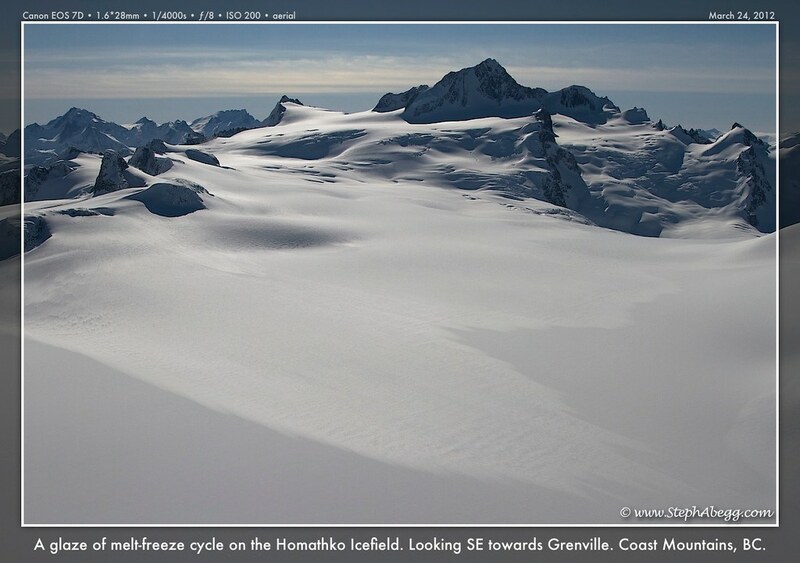 On the route back to Campbell River, we detoured about 30 miles to the southeast to the snowy expanse of the Homathko Icefield, where we photographed Queen Bess, Grenville, Bute, and several summit islands rising out of the ice. Now I know for certain I've got to climb in the Waddington area someday, and the Homathko Icefield inspires me all the more so to get into skiing. Words can't describe how spectacular and unique this experience was. The best I can do it show some photos from this amazing aerial adventure. Enjoy and be inspired! John arrives at hangar at Concrete Air Strip, puts heater on plane, loads survival gear, files flight plans and custom reports. 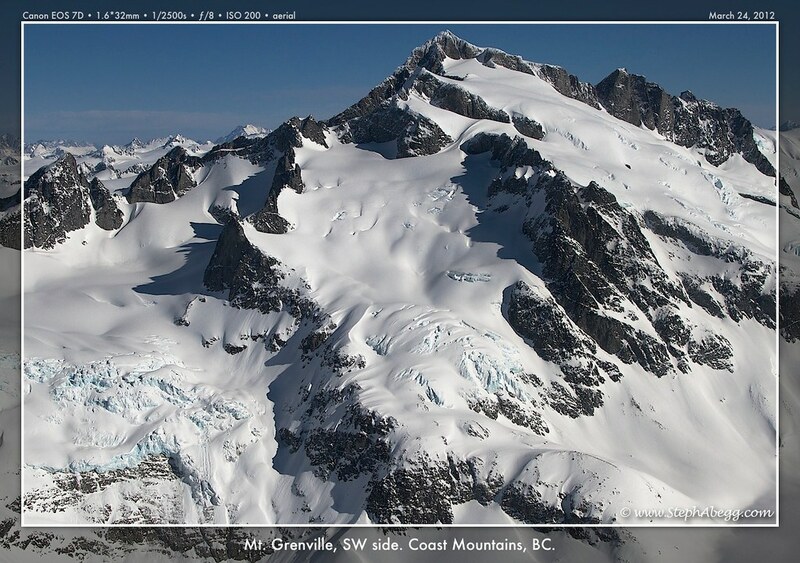 Fly from Concrete to Campbell River (Canada Port of Entry), all at about 4500ft elevation in calm and clear skies. Clear customs, refuel, use restrooms. Aerial photography adventure around Mt. Waddington and the nearby Combatant, Tiedemann, Asperity, Serras, and Bell, then over 30 miles SE to the Homathko Icefield including Queen Bess, Grenville, Bute, and more! Perfect weather and mountains in all directions. Hang out at Campbell River Airport refueling, snacking, downloading photos, and waiting until our scheduled crossing back across the Canada-US border. Fly from Campbell River to Bellingham (US Port of Entry). Clear customs. Fly from Bellingham to Concrete. Wow, Waddington and back in less than 10 hours. Some of my recent 10-15 mile snowshoe climbs have taken longer than this. The amount of terrain that John and I flew over in his RV-6 during this span of time is mind-boggling. 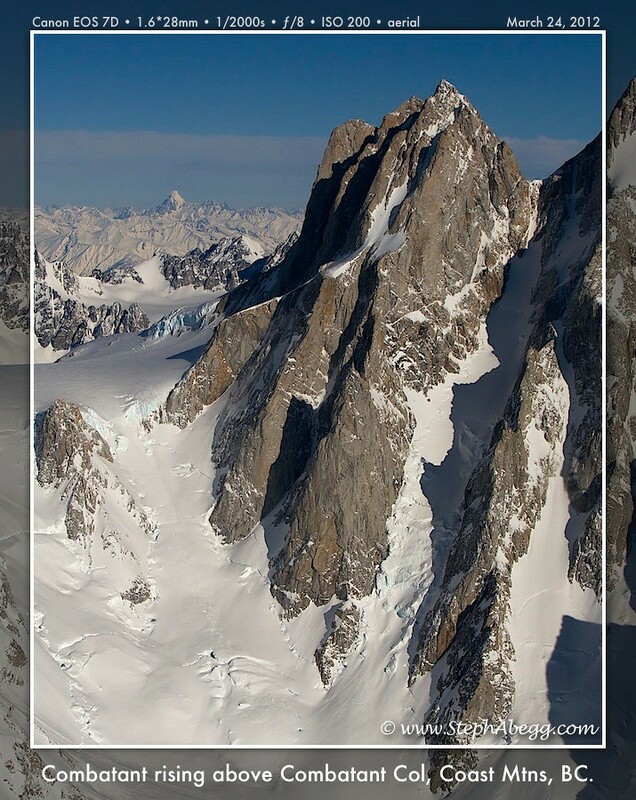 • Ascents: The first ascent of the main peak (via the SW Face) was in 1936 by Weissner and House; in 1942 by the Beckey brothers; and in 1950 by (a) Cook, DeSaussure, Long and Huston, and (b) Steck and Bettler. All these were Americans. The first Canadian team was Aldolf Bitterlich, Ulf Bitterlich, Arno Meier, John Owen, and Christian Schiel. • Name Notes: Adopted in 1928, after Alfred Waddington, who promoted the dream of a transcontinental railway from 1858 to 1872, via the Homathko river and Bute Inlet. According to BC Placename cards, R. P. Bishop, the surveyor, originally proposed the name "Cradock" in 1923. Don and Phylis Munday used the name "Mystery Mountain", but neither Cradock, nor "Mystery Mountain" were accepted by the government. 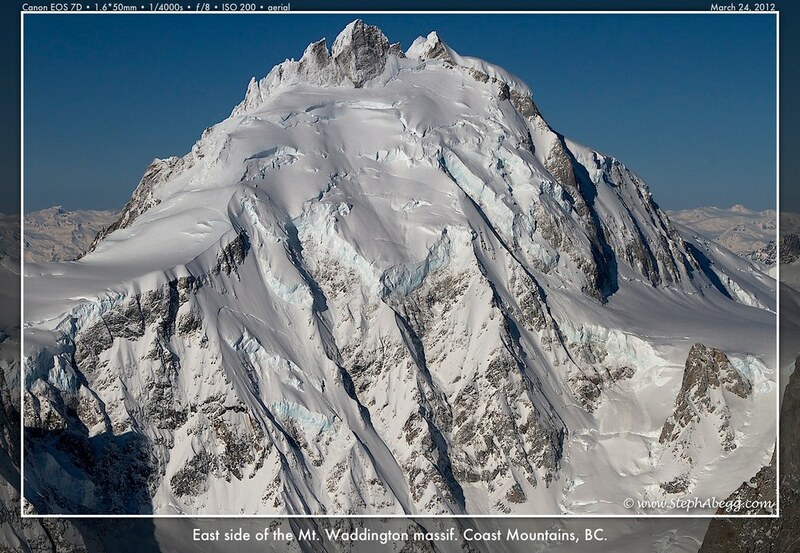 • Details: This peak is #3 on the Height List for British Columbia, after Fairweather Mountain and Mount Quincy Adams. It is #2 in Prominence List for British Columbia. It is located in southwestern British Columbia, at the head of Bute and Knight Inlets. 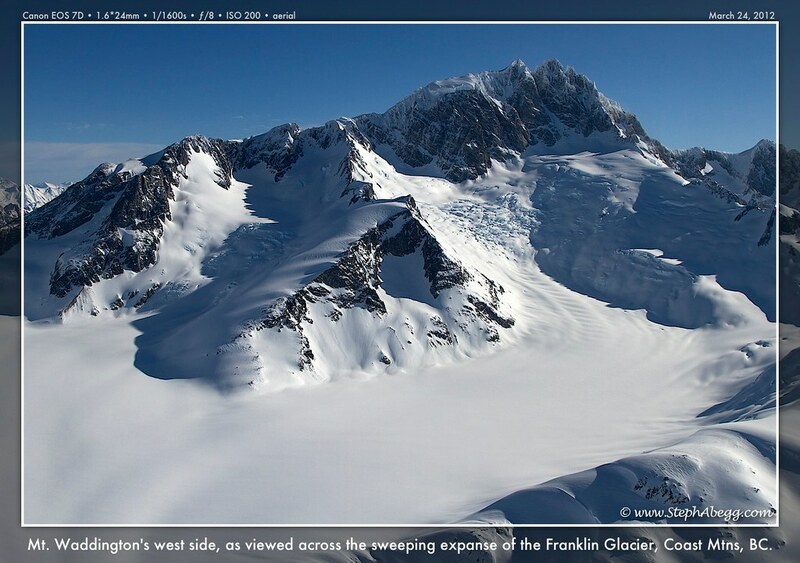 The mountain was first sighted by R.P.Bishop in 1922 while doing surveys from Mount Good Hope. It was then sighted again by Don and Phyllis Munday in 1925 from Mount Arrowsmith, on Vancouver Island. 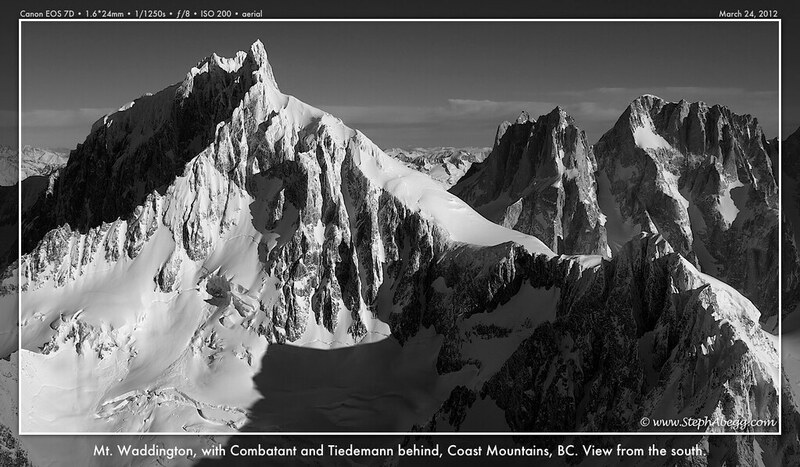 Between 1926 and 1934, they led several expeditions to the mountain. They successfully reached its lower northwest summit in 1928, but decided that the main summit was too risky. In 1948, Don Munday published the book The Unknown Mountain, documenting the couple's Mount Waddington challenges and adventures. • Name Notes: Name adopted in 1950. 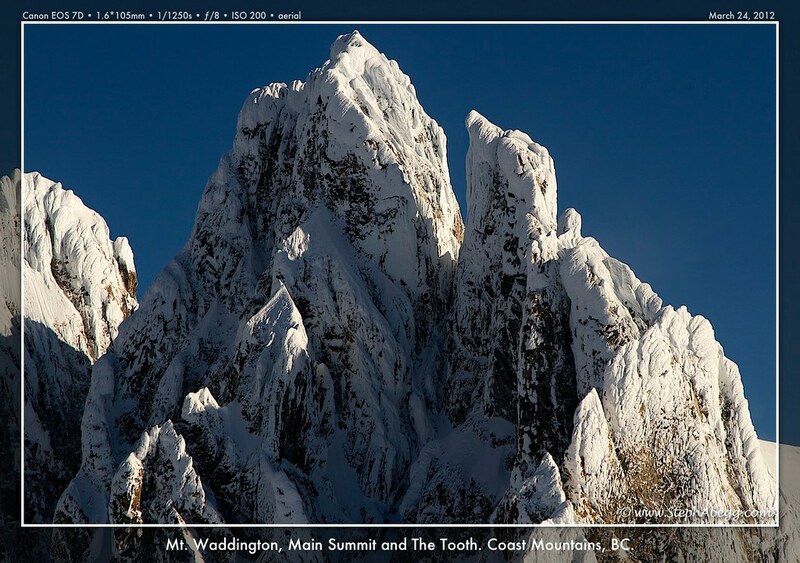 • Details: This peak is #10 on the Height List for British Columbia. 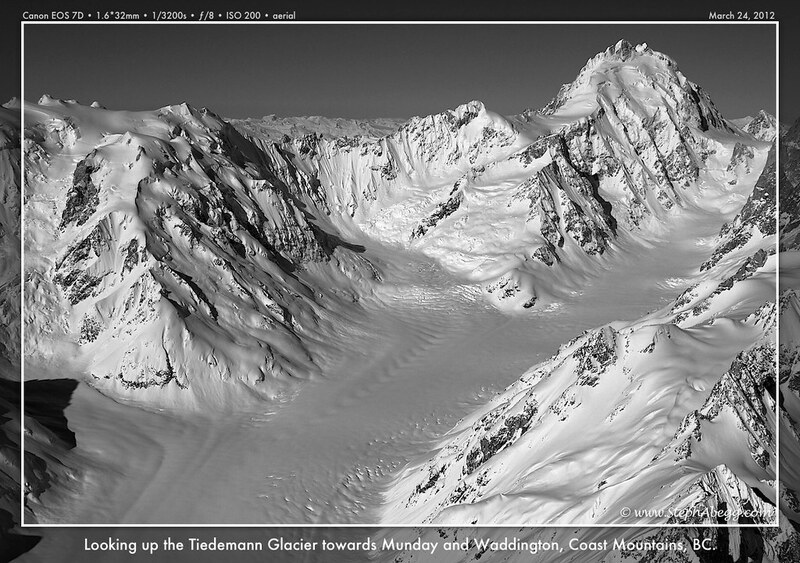 It is located 2 km NE of Mount Waddington, and 800 m west of Tiedemann. 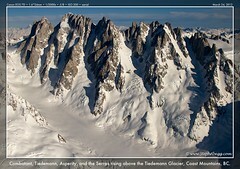 It is a superb summit made of pale beige granite with four outstanding parallel rock buttresses on its S and SW flanks. The highest point is on the southeastern end of the mountain. The SW buttress is climbed by "Skywalk", a 500m route of about a dozen pitches at consistent 5.8 and 5.9 on perfect sunny granite, the primo rock routes of the Waddington Range. • Name Notes: BC Placename cards say: Adopted 3 April 1928 on Ottawa file OBF 1018, as suggested by Don Munday because or its' proximity to Tiedemann Creek and Glacier (file M.1.27). The creek itself was named after Herman O. Tiedemann, CE, explorer of the Homathko River, 1862 - 1872. According to January 1972 advice from Provincial Archives, Tiedemann wrote to Mr. Waddington in July 1862, stating that he named this stream after himself, after nearly drowning in it. 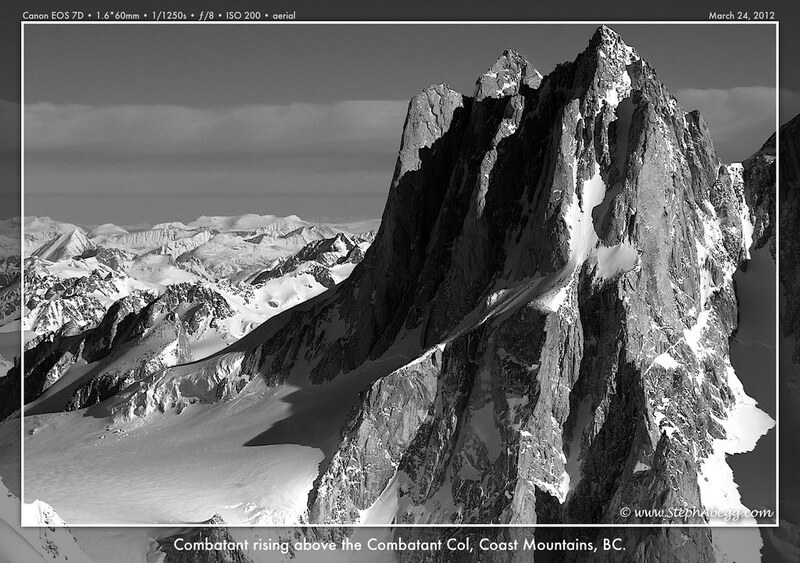 • Details: This peak is #8 on the Height List for British Columbia. 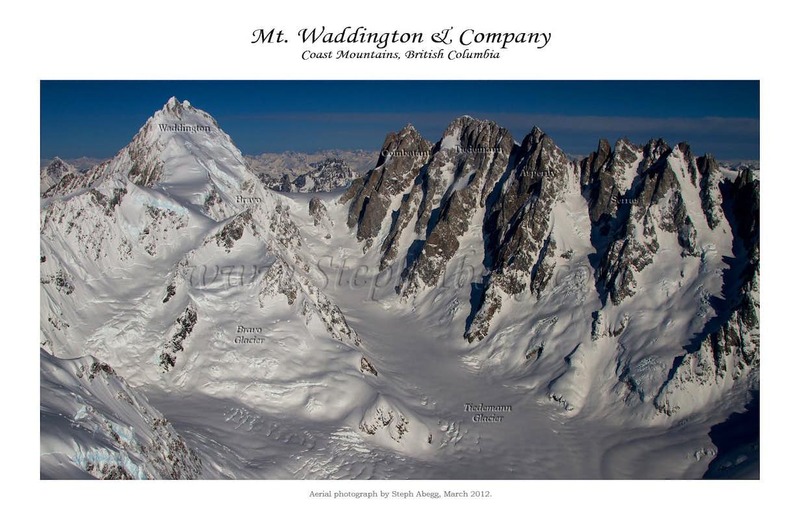 Mount Tiedemann is the second highest peak in the Coast Mountains, 3 km to the northeast of Mount Waddington, and separated from it by a deep pass joining the Tiedemann and Schimitar glaciers. 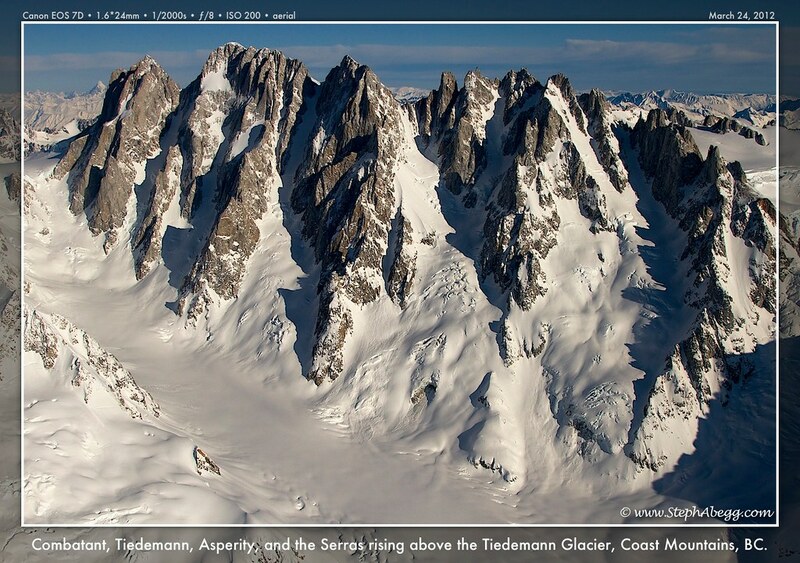 Tiedemann is the highest point in a cluster of peaks on the far side of the big drop. 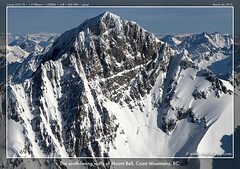 The south face is generally rocky; the north side is cloaked in snow and ice. • Name Notes: Named by the Mundays in 1926 for F.C.Bell of the ACC, not because of any resemblance to a bell-shape. • Details: A great pyramidal summit with a huge, impressively seraced north face located above Cannonade Glacier. • Name Notes: "Queen Bess" refers to Elizabeth I. 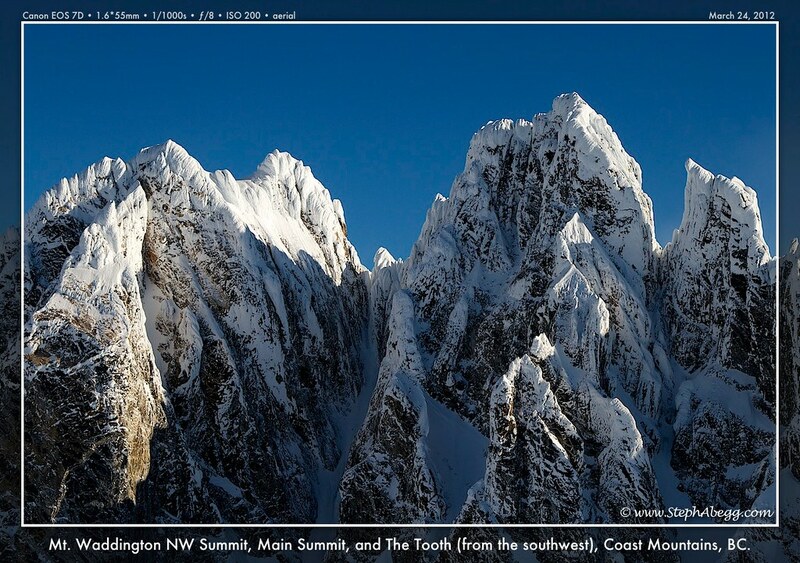 Many of the other peaks in the area bear Elizabethan names. • Details: This peak is #100 on the Height List for British Columbia. 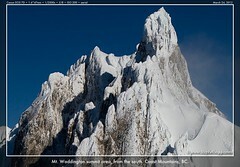 This peak is #12 in Prominence List for British Columbia. It is an impressive rocky tower which dominates the north end of the Homathko Icefield. 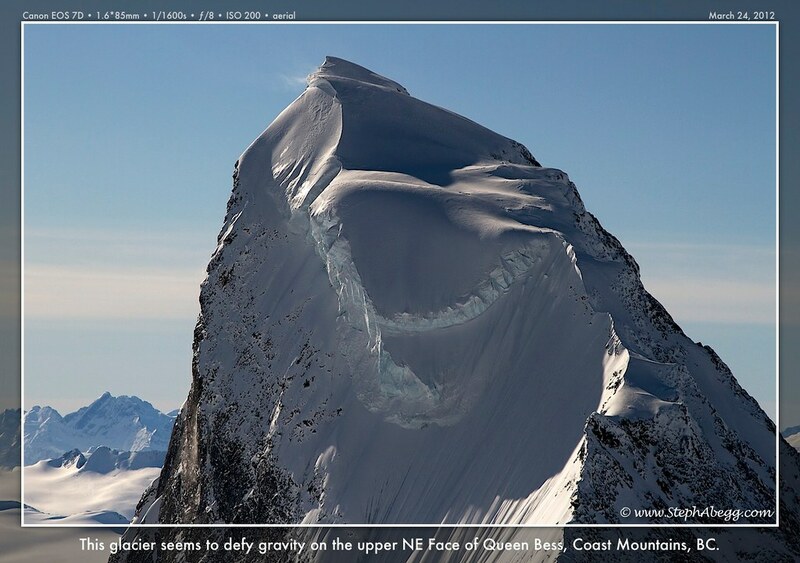 The northeast face is still unclimbed; look at the photo of the hanging serac and you will understand why (although in 2008 Jack Hannan and Jon Johnston came very close to climbing the face, but were turned back by blue ice under 8" of snow which made it unskiable). 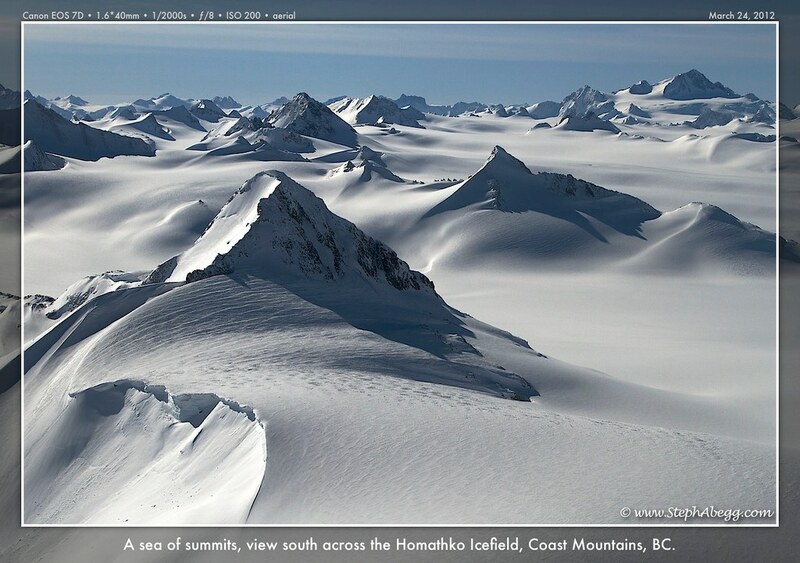 • Location: The Homathko Icefield is due west of Chilko Lake. It is east of Homathko River and north of Southgate River. 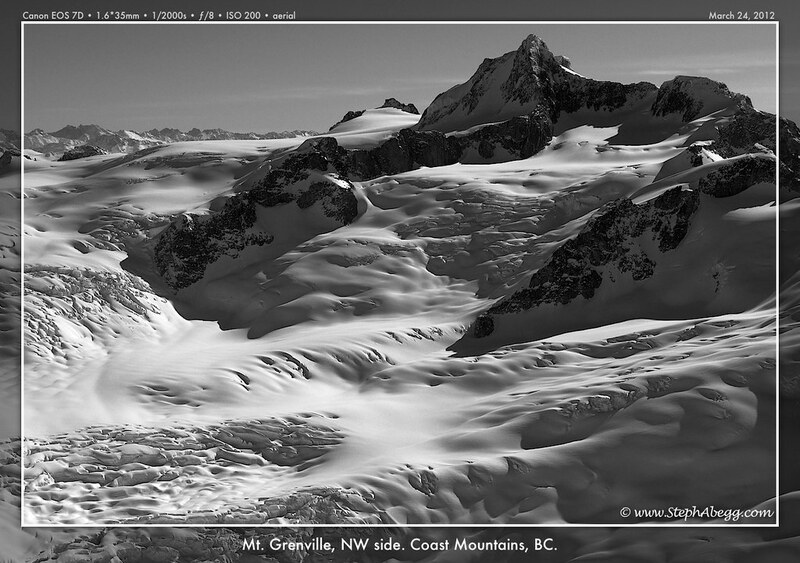 It is about 30 miles SE of the Waddington Range. 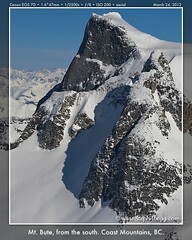 • Terrain: Rolling icefields flanked by steeper granite towers. • First Crossing: First crossed on foot in 1957 by the J.C. Rucklidge party. 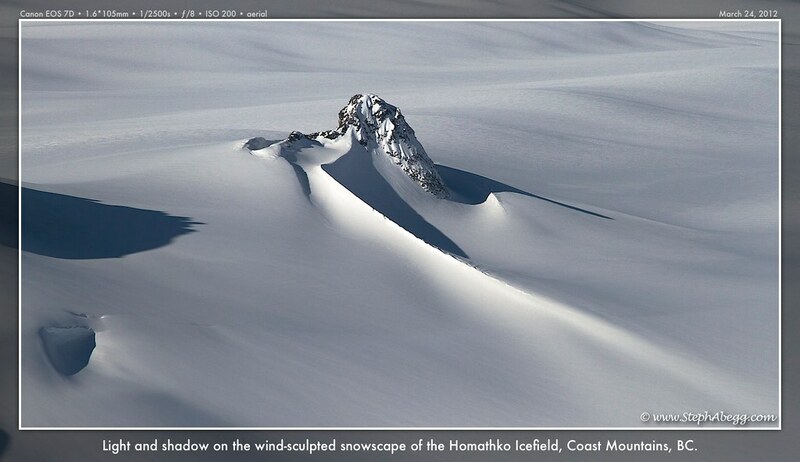 • Name Notes: Officially named the Homathko Snowfield from 1950 until the current name was adopted in 1976. Homathko is a derivation of Homalco or Homalhco or Homalhko, who are a subgroup of the Mainland Comox whose territory includes Bute and Toba Inlets. 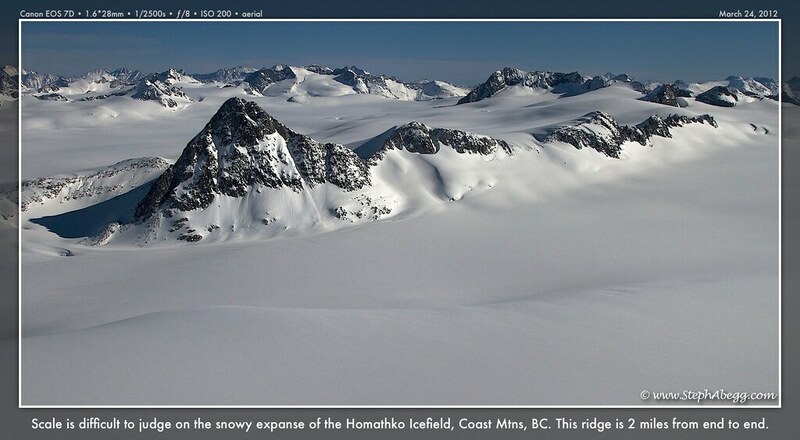 • Details: The Homathko Icefield is one of the largest icefields in the southern half of the Coast Mountains. It is largely an expanse of ice, about 30 km (19 mi) across, ringed by relatively minor peaks and distinguished, relative to the other Coast Mountains icefields, by lack of any major ones. 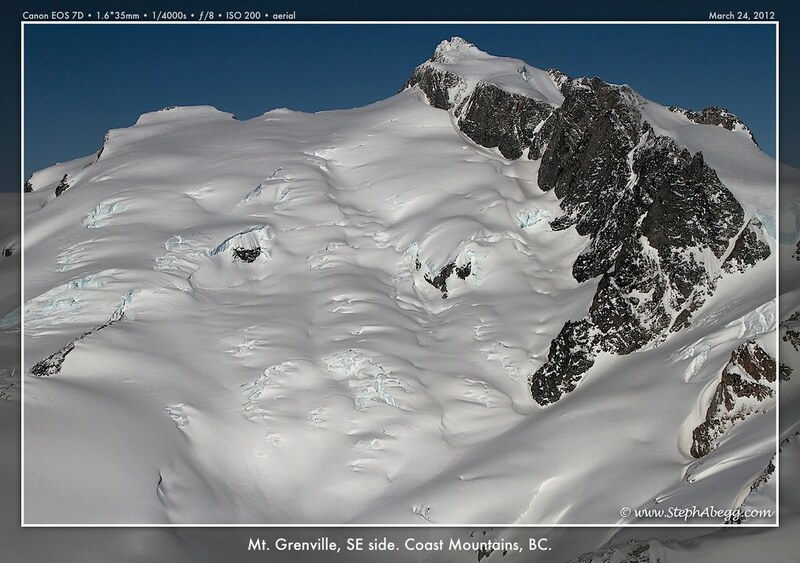 The highest summit of the icefield is Mount Grenville, located at its southern edge. 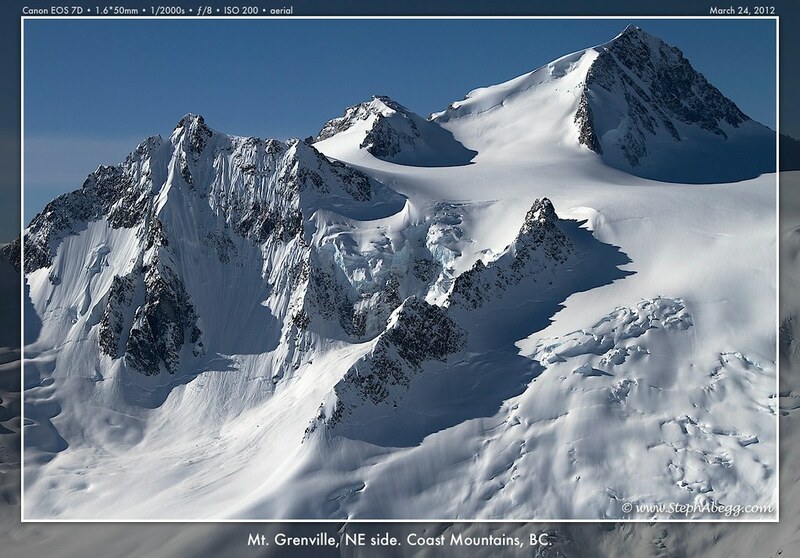 Just northeast of the icefield is Mount Queen Bess, the second-highest summit in the Pacific Ranges, and to the icefield's east is Mount Good Hope; near it, and within the icefield, are peaks whose names continue the Elizabethan theme - Burghley Peak, Howard Peak, and Walsingham Peak, named after soldiers and statesmen of that era. 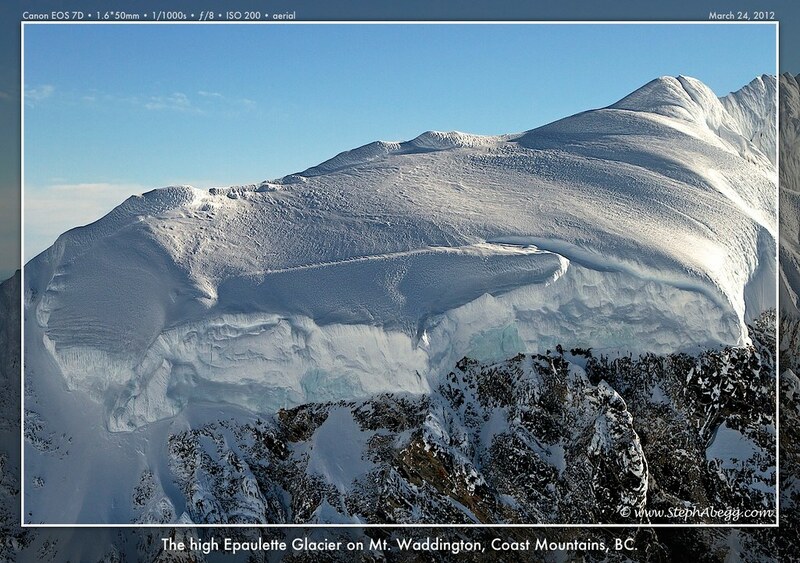 • Details: This high summit dominates the southern end of the Homathko Icefield. It is the biggest thing between Bute and Queen Bess and between Gilbert-Raleigh and the Waddington Range, and sticks out prominently. 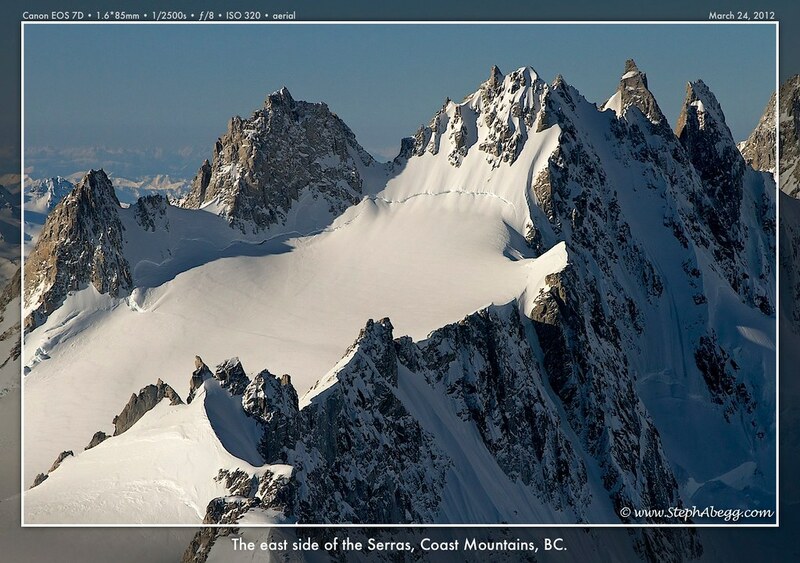 Despite the height, it is one of the very few 3000m peaks in the Coast Mountains that one can ski to the summit of. 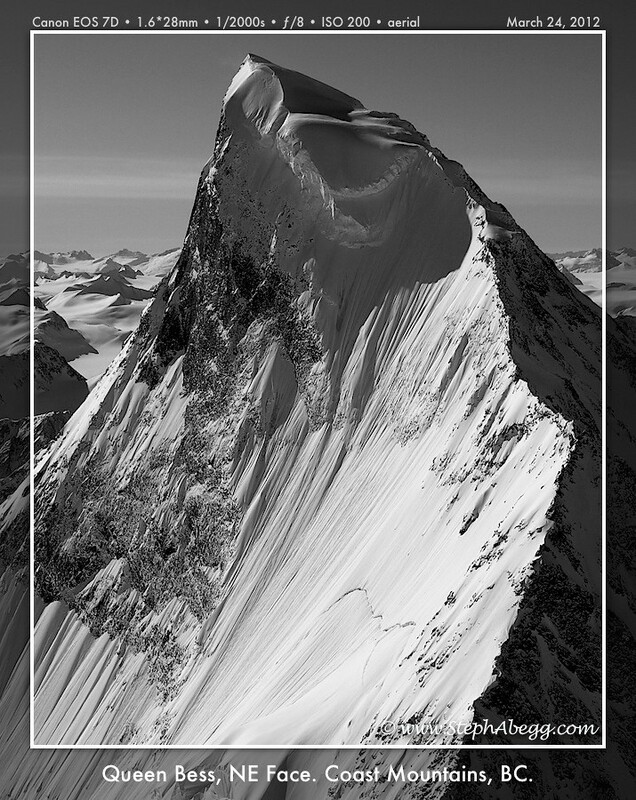 • Details: Located at the south end of the Homathko Icefield, this peak boasts a mighty west face of sheer granite which saw a few spectacular rock routes developed in the 1980's and 1990's. An easier route climbs the lower angled east side. In addition to this aerial adventure, I have been fortunate to join John Scurlock on a number of flights over the North Cascades in his yellow RV-6. To see more of my aerial photography, go to my aerial photography page. 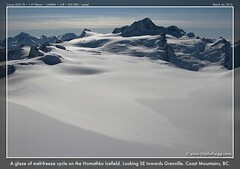 John is a well-known pilot and aerial photographer, go to John's website to see some of his amazing aerial photography. Thanks John for sharing your aerial world with me.